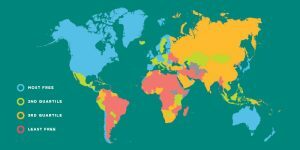 Comparing worldwide data on air quality from the World Health Organization with data on economic freedom from the Fraser Institute makes one fact abundantly clear: the most economically free countries are the ones that have the best air quality. That’s because economic freedom, human innovation, and access to energy are essential to economic prosperity and the ability to invest in technologies to improve environmental quality and human health. Government regulations that reduce prosperity ultimately deprive us of our ability to improve our environment. A recent paper published by the Life: Powered team goes into more detail about the link between prosperity and environmental quality, which is reflected in the incredible improvements in air quality in the U.S. over the past 50 years. Contrary to the popular narrative that our modern economy is leading us to environmental disaster, our economic prosperity — made possible by access to abundant and reliable energy — is enabling both human flourishing and lasting environmental quality. The U.S. should help developing countries mirror America’s environmental success in improving air quality by embracing the American ideals of economic freedom and limited government.